Giveaways and raffles excite partygoers. At your next event, give away door prizes to lucky winners. Gather up baskets and interesting containers to stuff for door prizes. Choose themes for each basket, and use the themes to choose the contents. Gift basket door prizes can range in price and size. After you have filled the baskets, wrap them up with cellophane and add a bow. Fill a small- to medium-sized basket with spicy seasonings and goodies. Fill the bottom of the basket with bright red shredded paper. 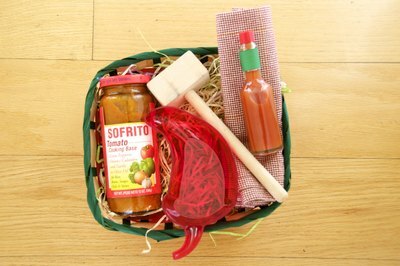 Add miniature bottles of hot sauce to the basket, and include a pepper mill with a variety of peppercorns. Include bottles of dried red pepper and onion flakes in the basket. Tuck in some potholders that have images of bright red peppers on them, and add a few handwritten or printed recipes for your favorite dishes as a finishing touch. 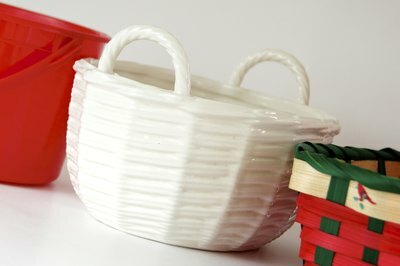 When you wrap the basket in cellophane, add a few plastic peppers to embellish the outside when you tie it up. 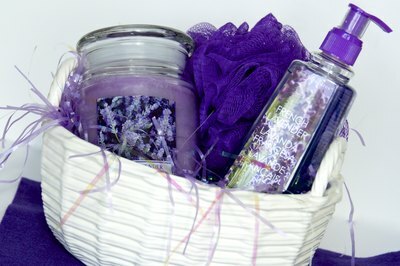 Use a purple basket to make a lavender-inspired prize. Fill the bottom of the basket with iridescent shred. Then add some lavender-scented sachets perfect for tucking into drawers and closets. Include some lavender scented bath oils, salts and gels as well. A purple-colored gel-filled eye mask will sooth eyes and look great in the basket, along with a pair of rolled up, soft terry cloth booties. Top the basket off with a small twig of dried lavender. Use a wicker basket, and add some brown shred to the bottom of it. Add a small cookie recipe book to the basket. 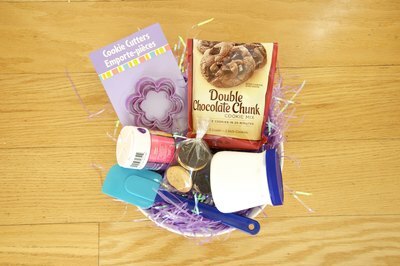 Choose some cookie cutters to put in the basket. Traditional cookie cutters like card symbols of hearts, spades, diamonds and clubs work well. Gingerbread men and women are also good cookie cutter shapes. Include inexpensive frosting tools for the winner to use for decorating the cookies. You might want to add some nonpareils or miniature candies. Do not use chocolates as they can melt in heat. 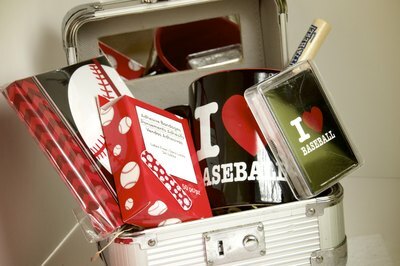 Guys would enjoy winning a baseball-themed basket. Inside a medium-sized basket, include a blow up baseball bat, an inexpensive baseball hat and a baseball. You might also add a pack of baseball cards, a baseball trivia book and a baseball keychain.